Meanwhile, Andreas Daniel finished cutting the movie into a wonderful black tent documentary sequence. He also has set the positions of sound and talk perfectly. Now, we are getting the Turkish dialogues translated into subtitles. There will be a German and an English Version. The speaker is ready to go but we have to make some fine revisions in the text. Still plenty of work but we are getting to the end of the task. The worldwide economic crisis (starting Sept. 2008) got even the black tent research into turmoil. It is difficult to support voluntary work when the economic base is broken. But starting with spring 2009 we already had felt the improvement of the situation. Now, we gained new strength and are able to continue the expensive development of the documentary movie. As well, we are proud to announce that clients can order new black tents starting with the next season April 2010 until July 2010. Just remember, that you must order the tent in winter so that we can prepare the action. The families are happy when some clients want to visit them and watch the tent building. So, with optimism spreading, we are looking forward to new challenges for the black tent research! As already announced, we had a fascinating journey (3rd till 17th Oct. 2008) through the desert Sahara. Many people say that the desert is everthing else but not what you expect. After that journey I may say that they are right. We went on foot through mountains and plains for about 11 days, led by a marvellous Tuareg team and 7 camels. Most of the time we went on foot, rarely we also used the camels to ride. 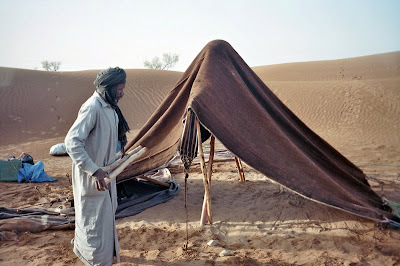 BaSallam (age: 74) is setting up the black tent. 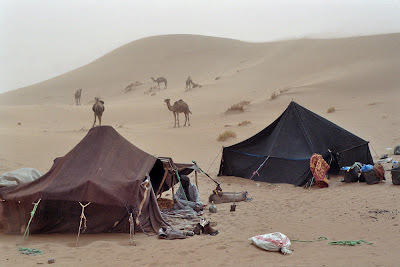 A black goat hair tent next to a modern black cotton tent set up in the prelude of a desert storm. The storm was no problem for the goat hair tent, while the cotton tent needed adjustment from time to time. Kristina in the clothing of Tuaregs. 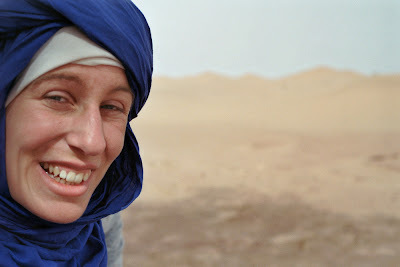 The "Chech", traditional scarf for the head, is a very important tool in the desert. It helps you breave in case of storms, to replace your sunglasses in case they broke, and to protect your head and neck from a dangerous sun. We needed a long time to find our way back to everyday life after that trip in the desert. An unforgetable experience. Happy New Year, dear Guests! It has been a long time, since the last post. Time has been rough for us. The economic crisis has as well affected the black tent research as our main sponsor "CINNOBER.AT" was totally affected by the economic downfall. Meanwhile, the company recovered and things become better. As well, the black tent research has narrowed its focus for the New Year 2009: Finishing the Black Tent Movie. That is the main task to be this year. As we have directly felt the cold grip of the economic crisis, we are still optimistic for things to improve. Again, this taught us, that one has to concentrate on the important things in life. Quality of life is not mainly a question of money, it is even more a question of heart. All the best to you and have a wonderful start into the New Year.